This is referring to pages on your website on a HTTPS protocol but are now being redirected to a page with HTTP protocol. It is not recommended to redirect HTTPS URLs to HTTP URLs as the HTTP protocol does not provide the integrity and confidentiality of data between your visitor and your site. Do also bear in mind that Google has explicitly stated that HTTPS is a ranking signal. When should I redirect a page from HTTPS to HTTP? There are very, very few (and niche) occasions when you would need to redirect a page from HTTPS to HTTP. As a general rule, we do not recommend redirecting in that manner. You should always make sure that the destination page in a redirect uses the HTTPS protocol. 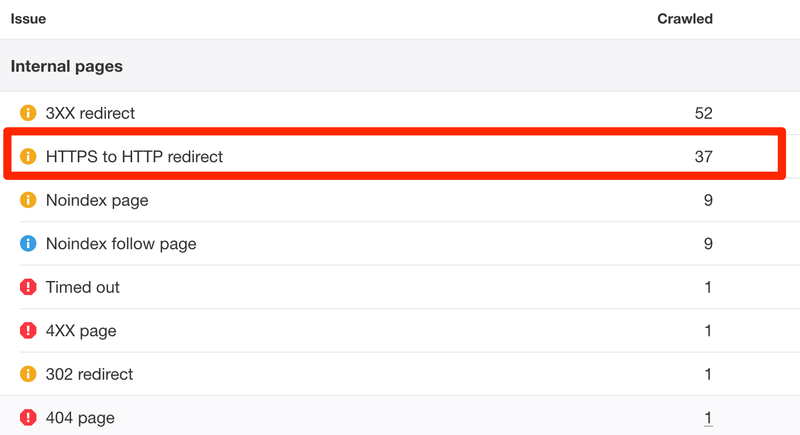 What does '302 redirect' warning in Site Audit mean?